Flashing LED indicators for "Low Battery" and "User in View"
Sloan's DFSM flushometers are equipped with Smart Sense Technology, which applies extended range and logic techniques to significantly reduce water usage. The DFSM flushometer automatically delivers a reduced flush when users are present less than 60 seconds. Touchless, sensor activation eliminates the need for user contact to help control the spread of infectious diseases. The Sloan DFSM are provided with Reduced or Full Flush Override Buttons to allow a "courtesy flush" for individual user comfort. The 72-Hour Sentinel Flush keeps fixture fresh during periods of non-use. Sloan's DFSM flushometers are activated via multi-lobular infrared sensor. By detecting user presence and duration, the DFSM unit will determine the proper flush volume for unequalled water efficiency. Sloan's electronic Dual-Flush Side Mount (DFSM) flushometers incorporate intuitive split-button design for easy manual activation. 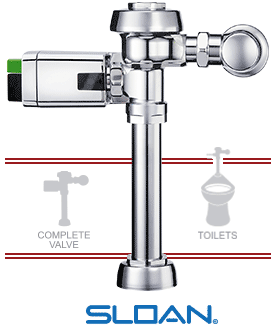 Assuming a 1.6 gpf diaphragm kit, the small GREEN button controls the reduced flush cycle (1.1 gpf/4.2 Lpf), the large BLACK button controls the full flush cycle (1.6 gpf/6.0 Lpf). Straightforward graphics alert user to proper activation. Reduced flush for liquid waste, full flush for solid waste. Features service mode which ignores targets for 10 minutes to enable fixture to be cleaned or serviced.